Join us on May 14th for our 4th annual 5K Run/Walk fundraising event! This 5k is an easy flat course (30 laps) on the indoor suspended track at the Ability 360 Sports and Fitness Center. Enjoy live music, entertainment, activities for people of all abilities and enjoy some good old barbeque cooking! Have a blast raising awareness and support for families affected by disability in your community. Your participation will transform lives! wheelchairs, strollers, and wagons welcome! WHY: The World Health Organization estimates a need for 20-30 million wheelchairs around in the world. In some countries the cost of a wheelchair can equal an average worker’s yearly wage. Consequently, many who are disabled are cut off from society and live in relative isolation. 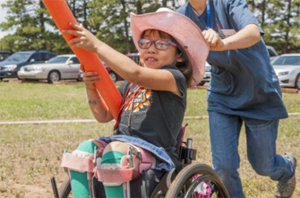 The cost to restore and ship a used wheelchair is only $150.00 but the impact is life-changing! 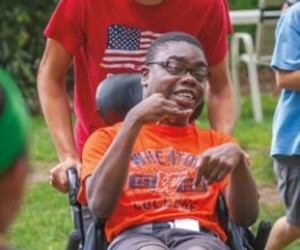 Our goal is to raise $30,000 between now and May 14th……..that’s 200 wheelchairs restored and shipped to developing countries for adults and children with disabilities. Your donations will help deliver hope, joy and mobility that is desperately needed around the world!